When I first began to hear rumblings that several groups were advocating for the ordination of LDS women, my immediate and somewhat surprising reaction was one of dismay. As a self-professed feminist, I realized that I needed to more closely examine that reaction. I am passionately interested in issues involving women and equality, and I have been deeply troubled by some of the cultural attitudes and practices within the Church that silence the voices and diminish the value of women. So what is it that makes me so uncomfortable with the current push for ordination? I guess to begin with, despite my respect for many of the women (and men) involved and my genuine sympathy for their frustrations, the sinking feeling I experienced when I realized that this was a legitimate movement came from a sense that the modus operandi felt wrong. I’m concerned about the whole approach, which is decidedly secular. It doesn’t surprise me that Kate Kelly, one of the founders of Ordain Women, is a human rights law attorney. I’m sure she’s a very good one and I applaud any and all efforts to further the cause of human rights worldwide. But ordination to the priesthood is not a human right. It is not any kind of a “right.” Trying to approach an essentially spiritual issue from the perspective of secular activism is neither reasonable nor appropriate. The Church is not a political entity. It is the body of Christ, headed by Him and led on the earth by living prophets who hold the keys to revelation for the Church as a whole. This is our theology. If we really believe this, then our actions must reflect that belief. As humble disciples of Jesus Christ, shouldn’t our approach be to ask for further light and knowledge rather than to make demands? This is an approach I can get behind. Yes, by all means, let’s ask our leaders to prayerfully consider possible changes. But when I go to the official Ordain Women website (ordainwomen.org), I find a very different rhetoric. “We call for the ordination of women and their full integration into the governance of the Church of Jesus Christ of Latter-Day Saints. This is the language of the secular world. Can we really say in one breath, “We sustain the prophet,” and then in the next, “We call for the ordination of women”? Do we really presume to have the insight, the perspective, and the knowledge to proclaim that “it is clear that Mormon women must be ordained in order to be full and equal participants in their church”? This kind of peremptory rhetoric is not going to get us anywhere, and may, in fact, hurt the larger cause. Which leads me to my next concern. As sons and daughters of God working together for the betterment of the Kingdom here on earth, it is essential that we comport ourselves always as “hopeful disciples of our gentle Christ” (President Uchtdorf). This means that we seek God’s will and not our own, that we put away “all bitterness, and wrath, and anger, and clamour” and be “kind one to another, tenderhearted, forgiving one another even as God for Christ’s sake hath forgiven [us]” (Ephesians 4: 31-32). In addition to my misgivings about the tone and general approach of the Ordain Women movement, I’m also concerned that it focuses on the wrong question (“Why don’t women have the priesthood?) and, in so doing, actually obscures the real issue. What is the real issue? What do women really want? President Linda K. Burton, General Relief Society President, thinks that the majority of women in the Church want “the blessings, not the authority” of the priesthood (here). It’s clear, though, from reading ordainwomen.org and similar sites that some women do want the authority as well. But according to Robert Putnam and David Campbell, authors of American Grace: How Religion Divides and Unites Us, only 10% of women in the Church say they would like to be ordained to the priesthood. Another poll (here), shows that number to be 8%. Obviously, then, the majority of LDS women are not interested in ordination. So what do we want? We want to feel valued and empowered. But validation and empowerment isn’t going to come through ordination to the priesthood. It’s going to come through understanding the power we already have. It’s going to come through knowing who we are. This, I believe, is what most faithful Latter-Day Saint women truly want; this is what we long for in our heart of hearts–to know who we are. We want to know what it means to be a woman in God’s Kingdom and in the eternities. We want to know that we are relevant in the grand scope of things, that we matter in crucial and enduring ways beyond our ability to reproduce. We want to know where to look to see what we can become. We want to know our Mother. We want to know our Mother. This, I believe, is the crux of the matter. This is the core issue we should be focusing on. The fact that we have a Mother in Heaven is a well-established (and utterly beautiful) part of our doctrine. The history of this doctrine has been thoroughly researched, documented, and written about here and elsewhere. The existence of our divine Mother has been acknowledged by leaders of the Church from the earliest days until now. This doctrine is even referenced in two official statements by the First Presidency of the Church. I have realized for some time that the source of my own deepest pain with regard to my womanhood has nothing to do with not having the priesthood (which, actually, I believe I do have–but that’s an essay for another time!). What I yearn for is not ordination, but a more open and official acknowledgement of our Mother in Heaven and a clearer understanding of Her nature, for with that will come so much else–divine empowerment, a sure knowledge of Woman’s central place in the Plan, and an absolute conviction of our eternal worth and relevance. I also believe that many, if not all, of the practices and prohibitions that are most troubling to women in the Church would gradually disappear as the majesty and centrality of our Heavenly Mother are understood and embraced by men and women alike. Why is it that we don’t more openly recognize the existence of our divine Mother? What, exactly, is so threatening about this truth? Why couldn’t the Young Women’s theme be changed so that our beautiful, strong young women throughout the Church could stand every week and proclaim: “We are daughters of a Heavenly Father and a Heavenly Mother who love us.” Or even, “We are daughters of Heavenly Parents who love us.” Can you imagine the difference this would make in these young women and their sense of who they are and who they are destined to become? Why is this topic still so suspect? I long for a sanctioned connection with my Heavenly Mother. I yearn for a truer understanding of who She is, because until I have that, I don’t think I’ll ever truly understand who I am as an eternal being. The ongoing dismissal of Her and the unspoken taboo of even speaking about Her creates a gnawing ache inside me, not only because it makes me feel like a motherless child, but because it causes me to doubt my own significance and relevance in the eternities. Am I to have no connection with my spiritual children? Will they never acknowledge me or speak to me? It is a devastatingly crushing prospect to contemplate. These, then, are the questions I believe we, as modern day daughters of Zelophehad should be pleading with our leaders to prayerfully consider and seek enlightenment on: Who is our Mother in Heaven? Where is She? What is Her nature? What is Her role in the great Plan of Happiness? Why is it not appropriate for us to speak to Her? These are the questions that will lead to the true empowerment of women, not “Can we have the priesthood?”. I believe that we already have at least the seedlings of answers to these questions in our scriptures, in the temple ceremonies, in the words of our leaders, and in our own hearts if we but have eyes to see and ears to hear. And there is so much yet to be revealed to us, “many great and important things pertaining to the Kingdom of God,”–glorious, ennobling truths so magnificent in scope and in brilliant in substance that our mortal minds cannot begin to conceive of them. But we must humbly and earnestly seek these things, and we must prepare ourselves in every way to be ready and worthy to receive the great outpouring of truth and knowledge that will come. Catherine Worthington is a wife, mother, writer, and teacher. She currently serves in an auxiliary presidency. She loves running, knitting, and crime TV. Next story June Young Women Lesson: What does it mean to sustain my Church leaders? Plus Bonus Lesson: Should I serve a mission? As a man I just want to say I couldn’t agree with you more. That was Very Well Written! Thank you for taking time to compose this. I agree that our relationship with our Heavenly Mother could bring a more godly model to our current religious structure. Female ordination could do it from another angle entirely. What I love most is that these two concepts are being talked about relatively openly in some circles within the church. This is where the change begins. I love being part of the LDS community right now. It’s a great time to be a Mormon woman. I’m glad Exponent is bringing an array of perspectives to this blog. The thought-provoking posts, open conversations, and genuine expressions of hopeful desire (for all kinds of good things) from so many different voices is beautiful. This is what I fail to understand. I fully agree that we should seek out Mother in Heaven, both individually and as a people. Thank you for eloquently setting forth the case for seeking Her. But why should we not also seek to empower women through priesthood service? Our sons are empowered both by a knowledge of their Father and by the opportunity to perform sacred ordiances in Christ’s name. Why should our daughters be limited to only a knowledge of their Mother? Why not also empower them through an invitation to perform sacred ordiances in Christ’s name? I also fail to understand why you believe you can speak for mormon women but Kate Kelly and others cannot. I personally know women in the church who feel no need to learn about Heavenly Mother. They are content with what they have. One could ask “why should they be dragged into something they don’t want just because you and a number of other mormon women desire to learn of Mother?” On the flipside, why should Kate and her friends be rejected just because a majority of mormon women currently do not desire what they desire? Must we wait until 100% of the membership is on board before moving forward? If so, blacks would still be denied the blessings that come through priesthood service. Finally, if the approach taken by ordainwomen is in error, what approach would you recommend to these faithful sisters (and brothers) who desire women to participate in priesthood service? I can relate to your concern about moving too quickly. But what about those whose time is running out? The space in which my daughters will be able to participate in the sacrament alongside their brothers is quickly coming to an end. As their father, should I not do everything I can right now in order to help my daughters have the same sacred experiences that my sons are given? 1. I wonder if our sons do truly have a knowledge of the Father because they have the authority of he priesthood. I think that it takes more than laying hands on someone’s head or being a bishop. Getting to know the Father means getting to know Christ (John 14:9 he that hath seen me hath seen the Father). Both men and women can and should get to know Christ. This is done through serving others, reading scriptures, attending the temple, and by loving one another. Women are not “limited” to knowing only Heavenly Mother. Where do we learn about her? By knowing God. Mother and Father are equal, just at Adam and Eve are equal. 2. The membership of the church didn’t cause blacks to get the priesthood. God allowed that wonderful blessing to finally come. Prophets prayed about his issue until it was granted. I wonder if blacks were denied the priesthood for a number of years in order to test us, to make us prove how loving we can be toward others. That’s my own speculation and I have seen how such differences have brought out racism in others. We will be judged for that. Such unfair circumstances will not be forgotten by the Lord. This life is short, eternity is a long time to be rewarded after a lifetime of hardship. 3. If your daughters are deprived because they don’t pass the sacrament, then they are missing out on the amazing blessings of the priesthood that they do have. They are not taking full advantage of the blessings from God if they feel deprived spiritually. I work in the temple. This has allowed me to fill fulfilled. I hope that you and your daughter can find a way to be fulfilled, too. Studying the scriptures and praying also fill me with light. I feel powerful, that is a gift of the priesthood. You can fill that, too. There is no magical switch that flips on when a person passes the sacrament. It’s the same switch in you that comes on when you serve others and love people. Melody, thank you for your thoughtful comment. Yes, it really is a great time to be a Mormon woman, isn’t it? I, too, am thrilled with the openness with which these issues are being discussed. Dave K, I appreciate your comment as well (italics and all! 😉 ). You ask some very good and very fair questions. Let me reiterate that the hesitancy I feel is not over whether or not women will ultimately be ordained to the priesthood (or priestesshood). It is, rather, with the approach that is being taken by the most vocal and visible groups within the movement. I don’t think that we can apply a secular template (that of secular activism) to what is a decidedly non-secular issue. If we truly believe that this is Christ’s church, led on the earth by living prophets who hold the keys to revelation for the Church as a whole, then we must conduct ourselves in accordance with that belief. That means that we don’t “call for the ordination of women” or presume to be in a position to make statements such as ” . . . it is clear that Mormon women must be ordained in order to be full and equal participants in their Church.” It doesn’t mean, however, that we can’t ask our leaders to pray for further light and knowledge. There are all sorts of ways that we can do that. We can write sincere, respectful letters. We can give voice to our questions and the pain we feel in carefully crafted articles and essays and blog posts. We can talk about our questions in gospel doctrine classes and Institute classes and sacrament meetings and stake conferences. Asking questions, seeking knowledge and understanding, has always been encouraged in our theology (if not always in our culture). And I believe that the more we ask the questions, the more likely it will be that our leaders will begin to think about and ask those same questions. What I’m proposing is that we focus for the time being on something that is less likely to provoke institutional resistance, something that is already established doctrine–the existence of a Heavenly Mother. I firmly believe that the more we talk about our Heavenly Parents (Mother and Father) and the better we understand their relationship, the clearer our vision will be of the infinite power and value of both men and women here on earth and in the eternities. Catherine, thank you for writing this! This is, indeed, a great time.to be a Mormon woman—in large part, I believe, because more of us are more vocal about the kinds of spiritual connections we seek for. As I see it, everyone’s needs are a little different. Some women feel validated and connected to the Church as it is; others yearn for a connection (or have one but yearn for it to be “authorized”) with our Mother in Heaven; others feel called to and more fulfilled in the public sphere than in the privacy of diapers and tantrums; others feel called to the ministry but have no legitimate way to answer the call within Mormondom. As we answer the question, “What do women want?” I feel it’s important to recognize that diversity of voices and to acknowledge that we are all responding in our own ways to a deeply-felt vacuum—and then to have the courage to ask for God to manifest his/their will. It doesn’t mean, however, that we can’t ask our leaders to pray for further light and knowledge. There are all sorts of ways that we can do that. We can write sincere, respectful letters. We can give voice to our questions and the pain we feel in carefully crafted articles and essays and blog posts. We can talk about our questions in gospel doctrine classes and Institute classes and sacrament meetings and stake conferences. Asking questions, seeking knowledge and understanding, has always been encouraged in our theology (if not always in our culture). I think you’re far too optimistic about getting any change from the Church by trying to go through traditional channels. The simple reason is that the General leadership of the Church explicitly blocks all the channels. They remind us every year or two that if we send letters to GAs, they’ll be sent back to our bishop or stake president. They’re clearly not interested in our blog posts or articles, no matter how well crafted. I also don’t see that there’s a clear line between our culture and our theology. In the Church of Correlation, asking questions is absolutely, completely, thoroughly discouraged. I don’t know if that’s culture or theology, but it’s pretty clear. To be fair, though, even rank-and-file members far from Utah have occasions to ask questions of general authorities. I’ve been in a Saturday night stake conference meeting when an hour of the meeting was answering questions. When Sister Beck did a speaking tour that came through my area, half of that program was answering questions. And we had a stake RS event with a Seventy that was mostly taking questions from the audience. So at least once every other year, in my experience, have I had that opportunity. And some of the questions asked in those settings were not easy. We are mostly first-gen around here, not steeped in the notion of not asking questions:) In every case, the general authority looked the questioner in the eyes, with great compassion, and did their best to answer through the spirit. The questioners may not have liked all the responses, but certainly felt heard. That’s good to hear, Naismith. Thank you for the wonderful post. It says so many things I’ve not been able to communicate well here and elsewhere. Actually, more than that. It brings tears of relief to see someone be able to articulately, clearly, and calmly communicate these things. You have written such a good post. Thank you. Although the profiles of the people supporting the Ordain Women Movement have touched me and I only have love and admiration for ALL of them, I personally have felt hesitant to support it for the way the movement is doing things. It is obvious to me that all of us feminists agree that the the administrative structure of the church has to change in order to reflect the message of Christ. Where many disagree is on how to do this. By simply being officially ordained to the priesthood, we as women might feel more included and validated but it is not the right way of understanding our divine role in the eternal perspective, our female power and female destiny. We simply would feel an equal treatment with respect to men and boys (which is important too). However, like you write, by pushing and advocating for our Heavenly Mother we force the church leadership and the members to see how important it is not to have her invisible in our theology and that we do have divine power and a role beyond reproduction. Once this is accepted and recognized, the way church conducts daily business has to change. We might not even need the “official” priesthood because our priestesshood will be recognized and finally utilized as an equal power to the “priesthood”. For me, this would be the most organic, natural and fair process to make amends for what has wrongfully been done n the past and to make all women excited for their roles in the church during mortality and eternity. But also to finally give the well-deserved glory to the invisible and unappreciated Goddess of Heavens. I finally found the voice of my feelings. Thank you. I would like to echo EFH’s comment. Thank you, Catherine, for your thoughtful post that articulates how I feel, too. Thank you for your thoughts. You have eloquently expressed what I too feel as a woman who identifies as a mormon feminist. I am so saddened by this essay. Not because we have different views on the topic of ordination, but because of the tone and the way you discuss and dismiss some of your own feminist sisters. I will try to write a more comprehensive response later. But the way things have been presented here just really disheartens me. Catherine, I want to thank you for this as well. I appreciate the thoughtful approach you take here. As a supporter of Ordain Women, however, I do disagree with some of your objections. Rather than setting the cause of Mormon feminism back, I see the Ordain Women moving it forward in important ways. It is setting the outer boundary for Mormon feminism: requesting/calling for full inclusion into every decision-making body in the Church. In staking that position, it makes all sorts of other requests sound all the more reasonable. Suddenly letting women pray in General Conference doesn’t sound all that scary to some people once they realize that there are other significant movements underway asking for much more than that. Thus movements like Ordain Women can serve an important strategic purpose in furthering gender equality. More than that, however, I support Ordain Women because I believe that the cause is just, right, and godly. I am a woman, and I am fully human. There is no logical reason why I should not be able to act for God, just as men do. My community is sadly weakened by not welcoming the voices of godly women into decision-making bodies, and my heart aches when I think of my three year old daughter coming to realize someday that her church doesn’t want all her gifts. These are just a few of the reasons I support Ordain Women. I can understand the unease over the “call on” language, as opposed to the “request” language. Personally, I would probably favor “request,” knowing how problematic the other is to some Mormons, and also because asking — asking God, asking leaders — is how things get done in Mormonism. There is a great post here on Exponent called something like “Ask, Seek, and Knock” from a woman supporting Ordain Women. I think she’s right that these actions are fundamental to everything that is great and worthy in Mormonism, so I see no reason we shouldn’t be asking, seeking, and knocking for Women’s Ordination. As for Heavenly Mother, I want Her more present in our discourse too. My heart aches for that. If women are ever ordained, I bet we’d see more of it. “There is no logical reason why I should not be able to act for God, just as men do.” Gospel doctrine is not logical. Sure, there are many things that make sense in light of culture, history, etc. But logical? No way. There.s no reason why we baptize a child at 8, but if he dies at 7 years 364 day he goes to the CK. It’s an arbitrary standard supposedly revealed through revelation. Why would one accept that revelation and not the revelation that only men need to be ordained to the priesthood? I’m all for asking, imploring and encouraging dialogue as suggested in the OP. But when people demand something as if they are entitled to it, at some point we are no different than other faiths who meet and lobby and caucus and vote on doctrine in church congress. I don’t think that’s the way Christ’s church is set up. Stellar response, Caroline. I particularly like your closing point: ordaining women would get us more discussion of Heavenly Mother. The goals aren’t at odds; they’re complementary. Simply put, would you support female ordination if it was pursued in another way? If so, what way should be pursued? If the ordainwomen website omitted the “demands” and simply tried to “ask questions”, would you be supportive of that dialogue? Second, as to your desire for more understanding of HM (a desire I share), what concrete steps do you envision? Talks in sacrament meeting and general conference about Her? Re-wording the scriptures to have HM included within “God”? Adding new cannon to explain Her role? Praying to Her? Worshipping Her?!? As a church, right now we tip-toe around the issue, but to make real progress, to get real revelation, at some point a modern-day Joseph is going to need to kneel and pray to Mother. If you are willing to comment, I’d really love to know if you have done so? Have you spoken with Mother? Does she answer your prayers? I ask this because, for the church to include Heavenly Mother expressly in our theology – to pray, worship, and speak of her in equal ways to how we pray, worship, and speak of Heavenly Father – well that is actually a much bigger step than female ordination. Just look at the other xtian denominations that have ordained women. None of them worship a female god. Dave K, I very much agree with your last paragraph. Openly worshipping Mother is totally radical with respect to all forms of Christianity I can think of, and I think this is a big reason the Church mostly ignores Her. We are deeply concerned about prostletying and I think the Church seeks to appear as “normal” as possible, as non-other as possible, in hopes of attracting converts. I think it’s time we own our weirdness so we can become free to embrace our unique truths. I appreciate being able to discuss this issue. For some, it is difficult to understand how a loving God would want things to be as they are (with one’s chromosomes determining one’s abilities and choices). Some have come to the conclusion that a loving God would not support the discrimination, and that the mormon church doesn’t contain what God wants for their children. Since I’ve now suggested this, I’ve found my comments are often dismissed. What I’m saying is that there may be no way to reconcile the misogyny and discrimination within the mormon church. That women will always be subservient, that chastity and virtue can be removed from someone against their will. IMO, the mormon church will hemorrage members until it addresses this fundamental inequality. The mormon church does take secular cues in many arenas, from white shirts to using the internet. Unfortunately, many people want to hide their heads in the sand and pretend that American society hasn’t entered the 21st century. That a female CPA can’t be ward clerk or executive secretary because of her gender. The secular world is comfortable with women at all levels of management; for people to work in places that speak to their talents. Aerin – we don’t necessarily extend a call to a male CPA to serve as a clerk or executive secretary, either. In fact, I don’t know of a clerk or exec sec serving in any of the wards and branches in my stake who has a financial background. Yet, my stake is full of accountants and number crunchers. If the push to ordain women is solely based on the notion that women are more qualified to serve in certain callings I think the movement is off base. No doubt there are women who could serve wonderfully as bishops, patriarchs, and so forth. I also have no doubt there are many men who could serve wonderfully as RS presidents, YW Presidents and Primary Presidents. It just seems as if many (not all) supporters of female ordination have received personal revelation on this matter on behalf of the church. That isn’t the way I understand revelation works. The OP seems to be suggesting a softer way of asking for The Lord to intervene and clear up this confusion. Thank you for your thoughts. I do have to point out one curious thing: Using polling data to support an argument fully comports with the language of the secular world, rather than the theological one. Also, I’m wondering whether you want to *feel* valued and empowered or whether you want to *be* valued and empowered? I would venture a guess that if you were to poll active Mormon women as to whether they feel valued and empowered by the current Church structure, a vast majority would say yes. Where would that leave your plea for further light and knowledge regarding Heavenly Mother? Should revelation track polling data? I have to admit, this post is very disheartening and disappointing to me. I guess because I feel each person can be prompted to work to move things forward in different ways. I’m not familiar with the Ordain Women organization. 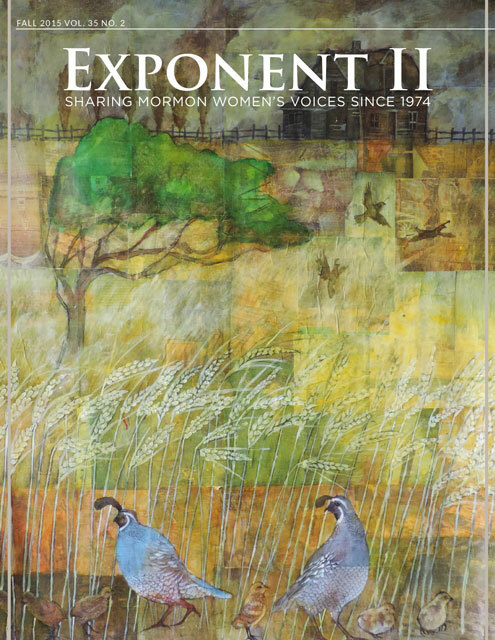 My only online connection to other mormon feminists is through the Exponent Blog. So any commentary I make will have to be based on the info in this post, but I don’t see how “call on” rhetoric or stating that women must be ordained in order to be equal participants in their church (seems like a truthful assessment of things to me) demonstrates a lack of sustaining church leaders, or militance (haste and divisiveness possibly, but I’m okay with making haste for something that is good and right, and at times being divisive with those who resist it). If the principle is true, then bringing it to the attention of church leaders can only be a sustenance to them. I think that a patient and obedient and “requesting” strategy has great value also however. I don’t think it’s fair to say that either one is hindering the progression, as I have seen both at work and both be effective in different situations. “It’s going to come through understanding the power we already have. It’s going to come through knowing who we are.” I feel like the statements you quoted from the Ordain Women movement, demonstrate more than anything else, women who understand the power they already have and who they are. If they’re anything like me they probably find God grants them great spiritual comfort and further confirmation in reclaiming and testifying of their nature when they feel prompted to do so. Also, while I agree that priesthood ordination is not a “right” in the sense that it should be granted to anyone and everyone, I definitely believe that it is a blessing that is earned by worthiness, and that in the eternities (and now, if we can overcome the current philosophies of men)God does not intend for the opportunity of earning that blessing to be restricted based on gender or race. I actually see very many parallels between the MoFem movement and human rights. I see priesthood ordination (in part) as Godly authority and sanction. I can understand having a hierarchy for organizational purposes, but I don’t believe God intends for an opportunity to be part of that hierarchy to be held in monopoly by men only, leaving women at the mercy of a male interpretation of God and Godly principles, just as politics illustrate, women having no vote in politics leaves women at the mercy of a male interpretation of what is just and good for individuals and society. And btw, thanks for all your thoughts concerning Heavenly Mother. I agree wholeheartedly there. I actually believe that if women were granted ordination and allowed to contribute within the priesthood hierarchy and offer a female perspective on God and Godly principles, that the LDS church organization would already acknowledge and provide much more information about our Heavenly Mother’s role in our spiritual progression. I said in my other comment that part of the priesthood is Godly authority and sanction and an opportunity to be part of the priesthood leadership hierarchy (which women obviously don’t take part in). But I believe the other part of the priesthood is the blessings, both for the priesthood holder, and those the holder serves. I also believe that worthy women are granted the blessings of the priestess-hood, and can call on Godly authority to bless those around them when appropriate. Is that what you mean when you say you believe you have the priesthood? I believe that the same applies to men too however, that God does not withhold blessings of the priesthood from worthy men just because of a lack of an ordination ceremony. If you’re willing to provide an answer, if you don’t believe the same applies to men, why? I truly pray you will have a direct experience of our Heavenly Mother. I have a testimony that She is real and She longs for us to know and experience Her. I disagree strongly with Pres. Gordon B. Hinkley’s directive not to pray to Her, but I also know he challenged us to “agitate” for the Priesthood! My non-member husband and I shared a unique spiritual experience about a year before we got married, and we both know in our hearts Who we encountered. I pray to Her regularly (as well as Heavenly Father) and make no apologies – to my Bishop or to anybody for that matter. No claims to patriarchy or “priesthood authority” can take away my special connection with Her. I do have a testimony Heavenly Mother is real, She knows us and loves us. I also firmly believe She wants us to be elevated to our rightful place as women. She knows how overlooked we feel, because She has felt the same way far longer than we have. The non-canonical Book of Enoch makes reference to this, as well as Proverbs 8. How exciting to come home after a long day to all these wonderful comments! Thank you, all, for taking the time to engage in this discussion and to respond so thoughtfully. I am not personally opposed to female ordination. But that’s not the issue. It’s not about what I want or don’t want. It’s not about my will (or your will, or any other human being’s will); it’s about God’s will. That’s what we should be seeking–God’s will. That is exactly what I find so problematic about the approach taken by Ordain Women. They are taking it upon themselves to “call for the ordination of women.” Let’s instead seek God’s will, through the proper channels. Truth is, I wouldn’t be at all surprised if what God wants for us is something far greater than what we call ordination! To begin with, let’s earnestly ask our leaders to change the YW’s theme to better reflect our doctrine. That would be a small thing with huge consequences. “We are daughters of Heavenly Parents who love us and we love them.” Also, yes, let’s talk more openly about Her–in lessons, in sacrament meeting talks, in General Conference. Let’s be vocal about our soul-deep desire to know Her better. Let’s change the patterns of our rhetoric so that we include Her when we express our love for deity. And, above all, let’s pray and plead with our leaders to pray for further light and knowledge regarding Her. What a completely splendid and revolutionary doctrine this is: We have a Heavenly Mother! This is where our focus should be right now because it has already been revealed. It is already part of our theology. We just don’t talk about it much. But imagine what could happen if we did! Kimberly, excellent point that what we really want is not just to *feel* valued and empowered, but to *be* valued and empowered. And thank you for sharing the link. I enjoyed reading that essay again. I’m not sure I quite understand the point you were trying to make about the poll results that I reference in my post. A poll is used to collect and measure public opinion. It is a secular tool used for the collection of secular data. Perfectly appropriate and reasonable. My concern with the Ordain Women movement is that they are attempting to use a secular template (the jargon and methods of civic activism) to address a decidedly *spiritual* matter (revelation for the whole Church on whether or not it is God’s will that women be ordained). And now I see that more comments have come in. I”ll get to them as soon as I can! By the way, the image that accompanies this post is a 14th century fresco from a small church southeast of Munich, Germany. 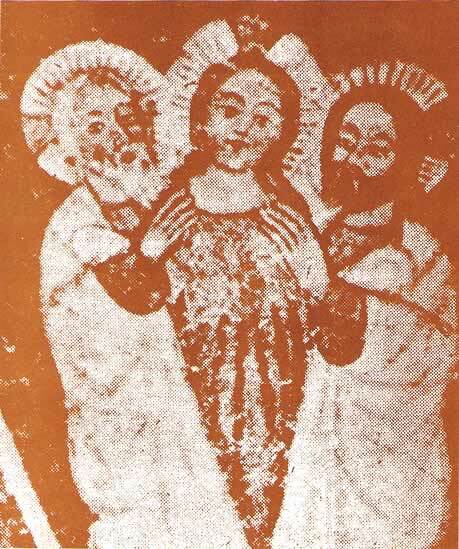 According to Dr. Leonard Swidler of Temple University, it depicts a clearly female member of the Holy Trinity. Way cool, huh? I think Catherine’s post brings up an important point to discuss: how do we navigate the hinterlands where activism and faith collide? This is a question that we at http://www.ordainwomen.org have been really earnestly trying to engage with. Catherine is correct to point out that ordination isn’t a right in any legal sense. In fact, under international human rights law and U.S. Constitutional law, private parties and organizations have the *right* to discriminate. Religious practices are fiercely guarded under both legal regimes (unless, of course, that practice involves ingesting peyote… religiously discriminate against women? Sure. Religiously dabble in hallucinogenic drugs? No WAY. http://www.oyez.org/cases/1980-1989/1989/1989_88_1213/). Sure, we don’t want to live in a society where we are forced to let male chauvinists attend the Exponent II retreat. We want to discriminate too! But, let’s face it, the rule of law has often been used to reinforce inequality with the authority of law. Just because it isn’t a right doesn’t mean the status quo isn’t wrong. At its core Ordain women isn’t attacking the Church’s right to discriminate. We are trying to get at something even more fundamental: their belief *in* discrimination. We are calling for everyone to re-think their belief that women and men have eternally distinct roles and that in all of those eternal roles women are excluded from all positions of authority and the power to act in God’s name. It seems we can all agree that things need to change. We women, and our female deity, need to be more included. But, we disagree on how that change will come about. Mormon women I know have a very difficult time being assertive and directly asking for what we want and need (passive aggression aside). With this background and culture I understand how directly asking (*gasp* demanding) for what we want to see happen can seem intimidating and selfish. However, I think that continually begging for “baby-steps” and incremental change simply reinforces our subordinate status in the church. A group of women in Zimbabwe that I represent inspired me to make this step of boldly calling for change. They literally risk their lives on a daily basis to call for simple and needed reforms within their community and fight for their own freedom of expression. They inspired me to, likewise, make a bold call for action. And, freedom of expression is, thankfully, a basic human right. I see absolutely no contradiction between sustaining the prophet and speaking honestly and directly about the thing I desire most in this world: true equality and ordination to the priesthood. I don’t think I respect myself or my leaders any more by beating around the bush. Ordain women! Kate Kelly, thank you for dropping by the conversation here. For the most part, I think I’ll just let your comment speak for itself. I’m sure you didn’t mean for that to be as condescending as it sounds, Kate. Most Mormon women I know are strong, confident, smart, and very capable of being as assertive as they need to be, especially when it’s for a cause they truly believe in. Thanks, again, for your remarks. God bless you in the work you are doing in Zimbabwe and other areas of the world. Clearly I would not ask someone to re-think a belief they do not hold as that would be nonsensical. If you don’t have that belief, don’t re-think it! Maintain the thought status quo! Speaking of maintaining the status quo & thoughts… I simply don’t *think* that the *status quo* will change unless we ask, clearly and directly, for what we want. No need to couch it is terms other than what we mean. We want full equality, and nothing less will suffice. I love this post. It articulates exactly how I feel. I would love to see changes come about that don’t require ordination (although if ordination were to come, I would welcome it.) My longing is to have a divine role model – to see my eternal worth and destiny as modeled by Heavenly Mother. We have been told that our role is important, but until we see a divine model, how can we really understand it? And men could no longer easily dismiss the feminine voice if they were able to see the majesty of HM. (1) Christ is the image of the Mother, just as he is the image of the Father. We experience God the Father very little in scripture; we tend to experience him vicariously through Christ. I think we can learn a lot not only about the Father, but the Mother through him, by studying his life and attributes. She sent her Son into the world too, and gave him as a sacrifice for many. As we honor and cultivate the divine attributes of Christ in ourselves, we honor and become more like our Mother. (2) Ask to know more about your Mother in prayer. One thing I have wondered is if we are overdoing the ban on praying to Heavenly Mother too much. We can mention Heavenly Mother in our prayers, we can share our love for her in our prayers, we can ask about her in our prayers. To push the envelope even further, and I think it’s at least worthy of food for thought, perhaps the “ban” against praying to Heavenly Mother refers to praying to her alone? If so, is it alright to pray to your heavenly parents as a joint unit? We do this in “O, My Father” every time we sing it to the end. We invoke them both in the last stanza: “When I leave this frail existence, When I lay this mortal by, Father, Mother, may I meet you, In your royal courts on high? Then, at length, when I’ve completed All you sent me forth do, With your mutual approbation Let me come and dwell with you.” Note how we ask our Heavenly Mother (and our Heavenly Father) to let us come and dwell with her (and him). Why would we do in a hymn what is forbidden to us elsewhere? Given the LDS tradition of equating hymns with prayers, I think this connection is even stronger. Food for thought? From a communal standpoint what I would like to see more of, and have failed to see much of at all, is artistic representation of our Mother. Heavenly Mother has been the treatment of poems and hymns yes (although more would be welcome), but what of the visual and plastic arts? I can only think of one painting of Heavenly Mother. I think there is a large untapped well here, and that the Mormon community could benefit from more artistic activism on this topic. On to another item. I don’t know if the crux of the matter for Mormon women and their religious longing is wanting to know our Mother. Yes, that’s a big item, but it’s not unique to women. Believe me, it’s a feeling that many men feel too (I can count myself at least!) and can be empowered by. The issue of women and the priesthood is broader than this. It addresses issues that I don’t think understanding our Heavenly Mother alone will solve. Let me give some examples that might help to illustrate the point; I hope you’ll see the value in one of them ! If you’re a Mormon that believes our leaders are even marginally influenced by the cultures of their time in the way they interpret revelations, scripture, policy, etc. you start recognizing the value of having a women’s perspective in a variety of issues, such as, say, in church disciplinary councils. On a practical level, the priesthood could bless more families (especially single-parent households) if women hold the priesthood. It would help women who have not and/or cannot be mothers, or who have had their children pass or move away, be more integrated into (and feel valued in) the church. It’s far more difficult for women in the church than men to feel they are fulfilling their “duties.” Men can always (or at least to a far greater extent) fulfill their priesthood roles more easily than women can fulfill motherly/childrearing ones that are far more contingent in terms of time, a partner, and biology. I struggle to believe that “validation and empowerment isn’t going to come through ordination to the priesthood. It’s going to come through understanding the power we already have.” I don’t doubt that power can come through a greater understanding of what is already extant, but why is this at the exclusion of priesthood ordination? Men are often taught about power in the priesthood, the blessings and joys of the priesthood. It seems odd to say that none of those things would trickle into women’s experience if they were ordained. But maybe you don’t mean that. Of course, women “not wanting” the priesthood is a different matter. I admit I am skeptical of the statistics about only 8% of women wanting to be ordained to the priesthood. I think many people are simply afraid to voice this; a mental block has been placed in their head because they don’t want to be considered apostate, impious, going against the brethren, etc. And so I see the question of how many want it is incomplete, for it doesn’t address why they do/do not want it. The same thing goes with Heavenly Mother and a variety of other topics (organic evolution). I can’t tell you how many times people told me to “watch out” and “not get excommunicated” when I wrote that article on Heavenly Mother. Many argued that there was a “sacred silence” around her, which I made a target of dispelling in the article. I bet if many Mormons were polled about wanting to know more about Heavenly Mother that many would say “no” for fear of impiety. I hope the article Dr. Paulsen and I wrote helped dispel that fear. There’s a lot of wisdom there. But I also sympathize with those that want to be more “active” about it, although the nature of the right “activity”(ies) is somewhat hard to pin down. Martin, you’ve given me a great deal to think about here. Thank you for this thoughtful and clear-headed response. I will get back to you after work today. Martin, back now with some time to respond to your very insightful and measured remarks. Of course we can feel her love now, but I’m not sure I completely agree with your assertion that “our Heavenly Mother can commune with us as she wishes, nothing is stopping her.” I think that *we*–or, rather, our lack of acknowledgement–sometimes stop her. I’m reminded of the scripture in Revelation 3:20: “Behold, I stand at the door, and knock: if any man [or woman] hear my voice, and open the door, I will come in to him [her], and will sup with him [her], and he [she] with me.” (A little sidenote here: Remember when some of the General Authorities, Elder Oaks, in particular, used to always include these insertions whenever he read a scripture. I’ll admit that it can be a little cumbersome, but I miss those days!) Through deeply personal experience, I know that our Mother is there. She sees us, she loves us, she longs to commune with us, but we have to open the door. The point, of course, that Julie M. Smith was making with that analogy is that the absence of any mention of our Heavenly Mother in the vast majority of our official Church discourse is glaringly odd if, in fact, our Heavenly family is a divine model of our families here on earth. I love your points that we can learn much of our Mother through her Son and that, even though we’ve been counseled not to pray directly to Mother in Heaven until we’ve received further light and knowledge, we can still acknowledge/include her in our prayers. And I, too, would love to see more representations of our Mother in the arts. These are such excellent questions. Yes, can one “hold” the priesthood without being formally “ordained” to the priesthood? The temple ordinances and ceremonies seem to suggest that the answer is yes. In a talk given at Women’s Conference at BYU in April, 2011, Sister Julie Beck (who was then still General RS president) said: “Sisters, I’ve said before, I hope you go to the temple and pay attention. Pay attention and listen and look and learn and feel and understand what is happening, and the blessings and the gifts of the priesthood that come through the covenants and ordinances of the gospel. Young women are prepared to receive the priesthood–the temple covenants–in Young Women.” That’s a remarkable statement. Was it a mistake? A Freudian slip? Did she mean to say “temple covenants” but slipped and said “priesthood”? Or did she mean exactly what she said? Is she equating the priesthood to the covenants we make in the temple? Interesting food for thought. Okay, I’ve got to run, but will get back to your other points later. I appreciate the way you have approached the question of whether or not an actual revelation is required in order for women to be ordained to the priesthood. I guess that depends on how you define revelation. It would most certainly involve revelation and, since it would impact the entire Church, it would have to come from the First Presidency and the Council of the Twelve. I’ve actually heard a few. The most compelling comes from first-hand accounts of dozens of members world-wide who talk very emotionally about how the priesthood has changed their lives–their homes and families–in visible, measurable, powerful ways. This is particularly the case in some countries of South America and Africa where the culture of machismo is so wide-spread and deeply-entrenched. Both men and women in these areas talk about the miracle of how being ordained to the priesthood has brought fathers back into the home, how it has very literally turned their hearts to their children, to their families. If women in these countries were ordained, the likelihood is unfortunately high that some men would leave the responsibilities of priesthood blessing and performing the saving ordinances of the gospel to the mothers. We talk so much in the Church about women feeling relevant, but men need to feel relevant too. I think about my own situation. The mother-child bond is sacral. It is eternal and powerful and intensely holy. A mother’s body becomes the whole universe to her developing child. For a mother and child, a bond is there. It just is. So the question becomes, how do we invite the father into this sacred alliance of mother and child? Well, one way is by investing fathers with the privilege and responsibility of performing saving, sealing ordinances for their children, for their families. I’m so grateful that my own husband has this privilege. My connection with my children is already strong and immutable; I would not want to take this away from my husband or diminish in any way his feeling of being able to bless his family through his priesthood. And now, taking a slightly different twist, here’s one possible argument for why women perhaps don’t *need* to be ordained. A friend of mine recently mused that maybe women don’t need to be ordained because their very bodies are already chalices of the symbols of the Atonement. “You sisters belong to the great sorority of saviorhood . . . . Men are different, men have to have something given to them to make them saviors of men, but not . . . women. You are born with an inherent right, an inherent authority, to be the saviors of human souls” (Matthew Cowley Speaks 109). Thanks for your very thorough response to my comments. Let me clarify more on my point on “Our Heavenly Mother can commune with us as she wishes, nothing is stopping her.” You noted that our lack of acknowledgement (or one might add sin) stop her. I agree, but I want to point out that this is again because of her (their plans, their ethics, etc.). It is a self constraint, not an external one. If the Father or Mother wants to make herself known, they can do so. Otherwise (in my opinion), we are constructing very odd constraints on the power of deity. I just feel that people are overemphasizing the relationship we have with our Father, to the detriment of our relationship we have with our Mother. Our relationship with either of them is chiefly through Christ and the spirit (in other words, the mode of their expression with us is through these on the whole). Admittedly, the Father is noted in ordinances, prayers, scripture, and visions (in this latter just so slightly) more. But almost always the references are generic–it is about God’s character and love in the general sense, not in the specific instance of it, much as with Heavenly Mother. Specific divine actions seem largely delegated to the Son. As in my previous reply, I have wondered if the prayer “ban” is taken too far. Another possibility in prayer worthy of consideration is praying to “God,” recognizing that God is a joint unit. I recognize that these ideas are nonetheless unsatisfactory, as they still weigh in favoring the male aspect of deity. It’s almost like a failure of the Bechdel test when it comes to religious practice. We can mention Heavenly Mother in conjunction with Heavenly Father, and we can mention Heavenly Father alone, but we cannot mention Heavenly Mother alone. It’s not satisfactory. I still find the issue of the temple and ordination problematic. How can one have the priesthood without ordination? What does it mean? If the ordinances are efficacious without it, then again, why do men require ordination to perform their ordinances? Why this obsession with lines of authority, if God can simply delegate his priesthood through whomever he will? I find this to be a gaping hole in Mormon priesthood theology. It deserves a lot more attention than it has been getting. Let me get to your other comments. You suggest that granting women the priesthood would require revelation. Since extending the priesthood to all worthy males was done via revelation, I agree that is how it is likely to happen. However, I don’t think it needs to. I again bring up the case of women not praying in sacrament meeting, and then that being overturned. This seemed to be shifts in policy without formal revelation. And one does not need to think all policies are given by God. The scriptures themselves give us an example to the contrary: “Wherefore, for this cause the apostle [Paul] wrote unto the church, giving unto them a commandment, not of the Lord, but of himself, that a believer should not be united to an unbeliever; except the law of Moses should be done away among them, that their children might remain without circumcision” (D&C 74:5-6; emphasis mine). This isn’t to suggest that all policies are uninspired, or that we can just pick and choose which ones we want to be uninspired, but rather noting that such a thing can and does happen. I don’t doubt, however, that such a policy change would have to come from the First Presidency and the Twelve. As for the wanting to know more about Heavenly Mother, I do think many people want to know more, but I think when it comes on reporting to another person that people become self-conscious and hold back on how they really feel. I know several women who have feared excommunication by just discussing (and even moreso researching) Heavenly Mother. I am sure they would fit in this category. I can’t imagine them telling their Bishop, Stake President, or even Relief Society class that they want to know more about Heavenly Mother, even if they really wanted to. My point was to suggest that this muddies the stats on women wanting ordination, as they fear bringing it up. April’s comment below our string illustrates this very point. That being said, it is still a very interesting statistic and I’m happy you pointed it out. As for the argument for not extending the priesthood to women because of how it could affect male activity in the church: I have heard this argument before, but I don’t think this is a “good” one (a subjective notion admittedly). It rests on a distinctively consequentialist premise that I reject (I pretty much except a prima facie duties deontological ethics). If having the priesthood solely, making them feel especially needed, is the only thing that keeps men in the church, then they are pitiful and not worthy of the priesthood they hold. The priesthood won’t do them any good if they fear the sharing of it. Of course, we are all sinners, but I don’t see why God should withhold priesthood blessings just to make others feel needed (and so stay active). Should the Lord have withheld the priesthood from those of African descent to make white men stay active in the church? This seems to me too petty to be true. I’d like to believe the Lord would rather demand we give up such foolishness. As for the sacred alliance of mother and child, I don’t doubt that its special, but I don’t know if the father suffers a deficiency in this area. I have a son, and we are very close and I love him very, very much. We spend a lot of time together, and I feel an incredibly strong bond with him. All the time my mind will wander to him when we are not together, and I cannot wait to be with him. I do not feel that my wife’s bond with him is any stronger than my own, and my wife doesn’t think so either. He has no mommy preference; I was the first sign he learned, the first word he learned, and the first name he learned. My wife often thinks we’re closer. I don’t bring this up to suggest that “I am such an awesome dad,” but to point out that forming intense emotional-spiritual bonds is not unique to going through a pregnancy. I bet adoptive mothers and fathers feel the same about (most of?) their adopted kids. Sure, it may help (but it may depend on the child and pregnancy for that matter, lol, from speaking to a lot of my neighbors), but it’s not the only way. The priesthood could help males with this, but it’s not the only way either. Non-LDS Fathers don’t seem to be less connected to their sons. If anything, I could imagine the opposite: the long time that active fathers spend immersing themselves in church callings so that they are away from their children on Sundays and weekdays could make the kids feel both more distant to their fathers and even resentful to the priesthood itself. I can recall having such thoughts myself about my father. In regards to the Matthew Cowley quote, I don’t quite understand it. How are women born with this inherent right? Are they Saviors because they are mothers? But they aren’t mothers on their own… They have to be “given” something too, and some can’t reproduce. If so, are they nonetheless inherently saviors? And the inherent authority the church speaks of mothers having over their children isn’t discussed as being any greater than the inherent authority that fathers have over their children. I don’t necessarily see anything wrong with the concept within itself, but Elder Cowley would have to unpack a lot more than what he has said there. Interesting stuff. I realized that my discomfort was due to fear. I was afraid to open my mouth, afraid to break taboos against speaking my truth. When I look at this issue with a “sound mind” instead of fear, I realize, if it is appropriate to ask church leaders to discriminate slightly less against women, such as by not excluding women from praying at conference, or any other “baby step” proposal, why wouldn’t it be okay to ask directly for what I believe is right? I believe women and men should be treated as equals and given equal opportunities, not that women should be treated slightly less unequally. By actually saying what I mean and asking for what I believe to be right, I am using the spirit of power, love and sound mind that God has given me. I’m concerned about the whole approach, which is decidedly secular. Then the author goes on to list secular arguments for not speaking out in favor of women’s ordination. 1, Maybe it is strategically unwise to ask for equality, because leaders will react badly and we will lose some other, smaller battles. 2, What about the polls that say that the majority of women don’t want to be ordained? By assertively and directly asking my leaders for equality through ordination, I am expressing my faith in my God and my church. I am saying, I don’t believe this issue is about strategy or majority rules. I have faith that my church leaders will ordain women if they ask God and God says that it is right. Since God’s will is not subject to strategy or majority opinion, I dismiss these secular concerns that would impede me from opening my mouth. I will second Kate’s “amen, and hallelujah!” to this statement, April. But this is very different than saying: “We call for the ordination of women.” This isn’t even a subtle difference! So, which is it? Is the Ordain Women movement asking the leaders of the Church to prayerfully consider this change or are they calling for the ordination of women? Those are two very different things. I have enjoyed all this comments and it is so great to be part of this feminist community. The reason why some feminists might want a different avenue of pursuing the same goal is that the issue is very polarizing. Currently, there are more people who do not agree with any of us so, we face a very conservative majority. When something radical happens to a status quo or a regime, it is hard to predict the consequences of change. Good examples of this are political regimes changes in many countries in Eastern Europe or recently Middle East. There were revolutions, regimes fell but the new ones are not so different either. So, it has shown that a process rather an an abrupt change might be more effective in ensuring a genuine change in the system. At least, this is my perspective on change. The problem that the feminist cause faces are two: we are a very small minority because we keep loosing great people and are seen by many conservative church members as apostates. Therefore, as a feminist minority we have to work around these two big obstacles: 1. we need to increase the number of sympathizers to our cause and 2. be viewed as strong followers of the gospel. My opinion is that in order to overcome both of the obstacles I have listed above, we have to use a language and do things in a way that is not perceived as a threat by the majority and probably the leadership of the church. We have to be very savy about what strategies we adopt. Pushing more for the recognition of the Mother in Heaven, including her in our theological language and recognizing that she has power and priesthood equal to that of the Heavenly Father MIGHT be more effective because we are building on a foundation we already have. It is true that women had the priesthood in the Early Church and that is also a foundation we have. However, no one talks about it from the podium because the modern church is very different to what J.S established. Temple ceremonies have changed together with social and policy practices. Feminists who have written about this have been excomunicated. For some reason that I do not understand, it is perceived as somewhat threatening to talk about the early RS. And that is why I feel that the best starting point to push for the same goal (making women equal to man in the church) is Heavenly Mother. In addition, the Mormon community is made of too many sheep. They are used to follow and lead according to the handbook. We do not have many authentic leaders or followers for that matter. Even though historically we were a community of revolutionaries, culturally we have lost that. The community looks more uniformly (so we look united) to the expense of the individual freedom of expression and authenticity. I perceive that the Ordain Women movement is a great call for a righteous cause and done in faith but it doesn’t feet with the cultural sensitivities of the community (unfortunate indeed). Consequently, I have no problem with the movement itself but whether it is able to increase the numbers of supporters. And I am afraid that although it gives great visibility to the issue and its supporters, it is limited to attract more people. I might be wrong on this and I hope I am. Anyway, keep up the good work all of you. Thanks again for continuing a civil discussion. Your situation as the author of this post is particularly challenging since you are fielding questions from every direction. I appreciate your attempt to answer everyone. That said, I am now of the view that your are unfairly judging your fellow sisters (and brothers) who support female ordination. Try to look at this objectively. In the original post, you set forth your personal desire for something you feel would better your life and those of many other members – namely, a much deeper knowledge of and relationship with Heavenly Mother. You’ve also set forth some specific courses of action to aid in your goals (though you have not yet addressed whether you advocate for praying to Mother). Never once did you consider Heavenly Father’s or Heavenly Mother’s “desire” for these things. You just assume they want you to have them. I’m trying to be kind, but this is simply hypocritical. If you are allowed to speak out for something you desire, and to call on others to ask their local and general leaders to seek guidance on how to learn more of Mother, well then why the heck can’t you give the same right to others to express their desire for female ordination and call on their leaders to seek guidance? Are you willing to be judged by the same judgment you give against the members on ordainwomen? For me, both of the issues boil down to this. Yes, God’s will is paramount. But He (They?) have not created a system in which we simply wait to be instructed. We are supposed to wrestle with things and express our own will. The process of reconcilliation with God goes both ways. Whatever the gospel principle – female ordination, knowledge of HF, etc – it will not come simply because of God’s will; our own wills (personally and collectively) are just as necessary as His. Finally, I must address the false dichotomy that you raised in your last response to me: “Truth is, I wouldn’t be at all surprised if what God wants for us is something far greater than what we call ordination!” I’m 100% positive that God desires greater things for women than priesthood. But so what? We are commanded to seek ALL good things. If priesthood is good, we should seek it, even if it is not the only good. Which of these statements would you agree with? * There are better things prepared for women than voting, therefore women don’t need to vote. * There are better things prepared for women than learning to read, therefore women don’t need to learn to read. * There are better things prepared for women than priesthood, therefore women don’t need the priesthood. Let’s seek after all good – both knowledge of Mother and the priesthood. My hunch is the two are inseperable. Dave K, I fear that we will begin to tire other readers/participants by this endless circling. Let me state my position once again, as clearly as possible. I apologize if I haven’t been sufficiently clear before. I do not criticize anyone for asking questions, whether those questions be about the priesthood, Mother in Heaven, or the nocturnal habits of African Pygmy Hedgehogs. I actively *encourage* the asking of questions. I am also completely supportive of asking our leaders to ask questions. The point at which I become concerned is when members of the Church (men or women) take it upon themselves to “call for” (Kate Kelly herself used the word “demand”, albeit with an exaggerated stage gasp :-)) something that has not yet been revealed. Am I clear here? Yes, by all means, let’s ask if we can have the priesthood. Let’s ask (ourselves, each other, our leaders, God) what “priesthood” even means. Let’s ask why women aren’t formally ordained even though they are anointed to the priesthood in the temple. Let’s ask if there might possibly be reasons we don’t even begin to understand why men have been given certain functions of the priesthood that women don’t currently have. Let’s ask if those restrictions might be lifted. And then let’s “wait on God.” There is absolutely nothing hypocritical about my stance, Dave K. I advocate the asking of questions. I do not advocate bypassing the prophet of God. The doctrine of a Mother in Heaven is already revealed knowledge. I’m saying, let’s start here, with what is already revealed. And, yes, let’s continue to ask questions of all sorts. And ask, and ask, and ask. Catherine, I think I understand your position now. Thank you again for your thoughts. FWIW, I have also found myself uncomfortable with phrases such as “call upon” or “demand”. While those phrases show up on ordainwomen, I think what Kate and others are doing is really starting a dialogue. For many (most?) members, just considering that a woman could righteously desire ordination is a big step. Kate’s group is doing a lot of good, though some feathers are ruffled. To be fair, I think we must also acknowledge that recent successes have come from women “calling upon” church leaders to make a specific change. Your OP praises the recent prayers said by women in GC. Those prayers are a direct results of letters sent from Let Women Pray – letters that did not simply ask for a dialogue as to whether women could maybe, sometime, if we feel like, perhaps say a prayer. The letters boldly called upon church leadership to assign a woman to pray in the April 2013 Conference. In some ways that was more direct than what ordainwomen is doing. I’ll get off the circle now regarding ordination and try to mend fences by offering some thoughts on how to raise issues regarding HM. 1) This Mother’s Day, most english-speaking wards will sing O My Father. In the classes following that, we could comment about how much we love that hymn and reflect upon it being the only officially-sanctioned prayer we can make to HM. 2) In our prayers (both private and in church) we could express gratitude to Father for the revealed knowledge of Mother and ask that more knowledge of her be given. Doing so would not be a formal prayer to Mother, but would include references to her within prayer. 3) When testifying of Christ, we can express gratitute for the women who served as the first witnesses of his resurrection and whose witnesses are equal in importance to the apostle’s. I don’t think that it is fair to discredit this movement on the ground that it is “decidedly secular.” The church uses a lot of “secular” management and organization principles, hopefully with inspiration, but I suspect often without as God just expects us to use our talents and wants us to learn from the process of having to make decisions. And also, is Ordain Women really “decidedly secular”? Could it not be that faithful women have really prayed about this issue and feel spiritually guided in the Ordain Women movement? I can understand discomfort around Ordain Women. I myself am not sure where I stand. But I don’t think that is fair to discredit it because it is “decidedly secular.” Especially when the supposedly non-secular model has resulted in such institutional inequality to half of its members. I love this discussion. It’s just the sort of the thing I think we should be talking about. I appreciate Catherine for getting things started here, though I do agree with Nat that your tone is a bit dismissive. I fall on the side of support for Ordain Women and agree so closely with Caroline and Kate’s comments that I’ll just let those stand rather than repeating them. As Emily Clyde Curtis has suggested, we are all in the feminist body of Christ – and I appreciate everyone being at the table. These are difficult topics and I’m glad we are sharing civil voices as we talk it out. First I’ll just say I wasn’t at all tired of the exchange between Dave K and Catherine. Dave asked some very good questions. The other thing I wanted to add to the many great comments is, it’s not ordination or being able to openly worship Heavenly Mother, it’s both. Efforts toward one don’t detract from the other, they reinforce and complement each other, IMO. Finally, I saw the words “call upon” not at all as “bypassing a prophet of God”. – I think OW’s other statements make it clear that’s not their thinking. (If it were they’d start their own church.). But more of a rhetorical device. They/ we are getting a conversation going. Which is great! And of course they’re serious about what they’re asking for. But to me the words “call on” do not indicate a will to walk all over the prophet. Thank you for this! I’m still undecided on this issue, I flip-flop on a daily basis. I didn’t want the priesthood either until I learned that women in the early church used to perform washings, anointings, and blessings for the sick. And I wouldn’t have taken the initiative to study about it unless there was public agitation for it, so that’s something. But I agree that the methods and rhetoric can be very worldly, and it worries me that we’re not sending the right messages. There was plenty. There were prayers and criticisms and protests within the church. I remember speaking to a friend about his efforts as a BYU professor in the 1970s (and he had plenty of groups to align with) to get the church to change its policies, both because it was embarrassing to be so racist and because it was immoral. Just at BYU, there athletes and schools who refused to play BYU sports teams. The NAACP organized marches against the church, and the church was sued for racist policies in its approach to scout leadership. You’re right, I wasn’t searching the right terms but I should have tried Google a little more. I was eager to hear the editorial versions I might get from the intelligent minds in this setting, I just didn’t realize the editorializing would be done on my own merits as a researcher. Thank you for answering my question anyway! I just wanted to add that I am very encouraged to see that people are taking such a close and serious look at the website and really digging into this issue. That is *exactly* our goal and I consider it a great success that this conversation is happening here @ ExII and elsewhere on the blogosphere, in Mormon homes, family reunions, wards, activities, playgroups, get-togethers, dinners, missionary correspondence and all over! These conversations are crucial and beautiful. So, thank you Catherine Worthington for being part of this endeavor! Although I tend to follow the structure for prayer that Christ models in the bible, praying to Heavenly Father, from time-to-time I pray to Heavenly Mother. In moments of greatest need I seem to instinctively, sponteneously pray directly to the Savior – my savior – Jesus for relief and comfort. This isn’t something I consider beforehand. It just happens. I cry out for the one who can save me in this world. For me, that is specifically Christ. I think our souls cry out for divine intervention in different ways at different times for different reasons. As our heavenly parents and Christ are one in purpose, I feel confident that (regardless of official statements from prophets about to whom we should pray) my sould connects with God in the ways that serve God’s purpose for me. You’re welcome, Kate. I agree wholeheartedly that these conversations are vital. As so many have pointed out, this is an incredibly exciting time to be a woman. Pepper, it was an excellent question and of course you should have been able to ask it here without feeling demeaned. Melody, beautiful thoughts (as always). I will second Kate’s “amen, and hallelujah!” to this statement, April. But this is very different than saying: “We call for the ordination of women.” It isn’t even a subtle difference! Honestly, I don’t see those two as mutually exclusive. No, they’re not mutually exclusive, but one approach might sabotage the other, or at least dramatically decrease its effectiveness. More importantly, one approach clearly recognizes and respects the Church as the Body of Christ, led on the earth by a prophet, seer, and revelator, while the other does not. Is there a possibility that the founders of Ordain Women might consider making a few changes to the language used on the official website? I ask this very sincerely. I think it might make a great deal of difference. In 1977 when prominent leaders of the church were making public statements that black members of the church would *never* get the priesthood, at least until the millennium (let’s take that as a “we have prayed about it & the answer is “no” for our purposes)… what would have been the appropriate response of a member deeply troubled by this racist policy who was advocating for it to be changed? Looking back (with the benefit of hindsight, of course) if you knew of a person who said each of these things, who would you respect most? At any rate, your decision not to answer my question tells me everything I need to know. Thank you for taking the time to engage in this discussion. I sincerely wish you the very best in your life. Catherine’s refusal to answer Kate’s question is pretty revelatory too. What if we all ask it? Catherine, would you please answer Kate’s question? she’s not the only one who would like to know what you would do in the scenario she outlines above. If you still refuse, that will tell others everything they need to know as well. @Catherine Worthington I seriously apologize if you felt that was any type of an insult or attempt to shut you down. It was not intended that way at all. I honestly think you’ve opened up an important question. I am really wanting to know what you would do in that scenario/which one you would choose. Your answer to my question would actually influence my answer to if there would be a”possibility that the founders of Ordain Women might consider making a few changes to the language used on the official website” like you asked… which is what I meant by the Socratic method… a line of questioning leading us all to a different or unique place. When a prof uses Socratic method in law school it’s not just to goad the person out of an answer, it’s to think about a problem together. I really liked it, actually. It made me tighten up my thinking. Kate, I didn’t feel insulted or shut down by your comment at all! But I genuinely appreciate your concern and your apology. I love that we’re having this conversation. I’ll respond to your question below (where you ask it again). Thanks! So those who don’t want female ordination are brainwashed and afraid? How is that rhetoric any different than saying that women who want it are power hungry and haven’t prayed enough? And let me hasten to add that I would never endorse the latter. But I do get tired of the former. Although I am personally not opposed to ordination, just neutral on the issue because I see some great benefits to the current system. I am not convinced that the rest of the world is so far ahead. They view things differently, sure. But different is not always behind or less. I went to grad school and currently live in sections of the country where Mormons are rare. I joined the church in Europe, lived in South America, and have spent time in Asia. So I feel I do have a good idea of how things are done in the world, and I do not believe it is better. Indeed, many people I know think the church does lead on a lot of things including gender issues. I have a friend who is now a professor at the University of Michigan. She is not a member, and has told me many times that she envies the way our family operates and how I have shaped my career as a part-time professional (based on the counsel that I received at BYU). She feels that she was lied to by mentors in her early career, who minimized the demands of motherhood and told her that only full-time employment would provide satisfaction and a decent salary. I could tell story after story like that, of non-member colleagues who look at LDS women with great respect and even envy for the way we are equal partners in our marriages and have our work as mothers and homemakers respected. Whereas they are only considered equal if they buy that respect by a paycheck. Which may severely curtail the time they have for children, community service, and homemaking. So those who don’t want female ordination are brainwashed and afraid? A woman in a classical patriarchal society can wield formidable power within the family, even over her own husband, but only by maneuvering within the family’s reproductive system. In doing that, rather than by resisting male dominance within marriage or seeking closing ties with her husband, she ends up strengthening the patriarchal family. In such societies, women are likely to fear ideologies and movements that undermine family hierarchies, even if they elevate women’s individual autonomy. Any such disruption would be a threat to the protection they need when young and the power they gain when old. Coontz is referring there particularly to societies in “the Middle East, North Africa, India, and China, where girls are married at very young ages” and notes that “even in the late 20th century, a study of upper-class Hindu men and women found that most men were loath to develop close ties with their wives because time spent together as a couple undermined the intense bonds between men as fathers and sons and brothers.” So it’s not a perfect explanation for female self-loathing and fear of power and equality within Mormonism. But it does point out that in many ways, it’s logical (twisted logic, but logic nonetheless) for women to fear measures that elevate women’s status. Maybe not. And certainly there are religions and societies even more backwards and misogynist than Mormonism. but in basic questions of human rights like the civil rights movement and race, or questions of gender, or LGBTQ issues, the LDS church not only hasn’t led, it has been well behind the curve. Embarrassment over this fact, both among members and leaders, has been a motivator in the changes it has made. And rightly so. Embarrassment over the way the church has mistreated anyone who is not a straight white man is appropriate. I could tell story after story like that, of non-member colleagues who look at LDS women with great respect and even envy for the way we are equal partners in our marriages and have our work as mothers and homemakers respected. And even more of us could tell story after story after story after story, of non-members who look at LDS women with pity and sorrow for the way they’ve been brainwashed (to use your word) into thinking that rhetoric about equal partnership actually translates into some sort of equal partnership. They look at their own marriages, with husbands who don’t need to “preside” and who do a decent job of pulling their own weight in terms of child care and household management, and wonder why Mormon women pat themselves on the back for settling for so little. I am not brainwashed or afraid because I don’t agree with your view of ordaining women. To say this completely dismisses other sisters opinions, testimonies, gospel knowledge, and feelings! What is the point of this movement if you are only going to demean women who don’t agree with you. It has now been established that excluding black people from the priesthood was not revelation or word from God, but “tradition” or a desire to grow the church in an obviously race-conscious new country. (Should be obvious considering the God I like to believe in is not one who would exclude based on shade of skin color) The “revelation” in 1978 that black people could be ordained came on the heels of announcing a temple in Brazil and the leaders could no longer deterine who had “black” ancestry in that country…so it was more of a business decision than God saying, “Ok, I guess blacks can have the priesthood now, even though I didn’t say no in the first place.” Doesn’t seem like either of those those things really had anything to do with God…so it seems then that this issue with womens’ involvement would have a similar resolution. I’m not sure it’s really about God, but about tradition. It’s seems to be more about convincing leaders that it’s good PR or good business to involve women. Personally, I’d rather see movements of tolerance and acceptance for everyone, no matter race , religion, or sexual orientation first. Let’s include everyone and THEN talk about changi traditions concerning women. I still cannot believe that God looks down upon us and applauds our extreme exclusion of LGBT, that He commends “sticking to our guns.” It’s completely backwards for a God that I believe is unconditionally loving. I think it is a fallacy to assume that the way things are running now is how God would actually do things were He here. So as women, let’s embrace our divinity, and accept our own place in the Universe that “the gods ” created, and bless our children and our husbands, and call down guidance from the angels,and be examples to our neighbors, and have tolerancea , accept those who are different, nd seek our own understanding, teach THAT to our daughters and continue THAT tradition. It has now been established that excluding black people from the priesthood was not revelation or word from God, but “tradition” or a desire to grow the church in an obviously race-conscious new country. (Should be obvious considering the God I like to believe in is not one who would exclude based on shade of skin color) The “revelation” in 1978 that black people could be ordained came on the heels of announcing a temple in Brazil and the leaders could no longer determine who had “black” ancestry in that country…so it was more of a business decision than God saying, “Ok, I guess blacks can have the priesthood now, even though I didn’t say no in the first place.” Doesn’t seem like either of those those things really had anything to do with God…so it seems then that this issue with womens’ involvement would have a similar resolution. I’m not sure it’s really about God, but about tradition. It’s seems to be more about convincing leaders that it’s good PR or good business to involve women. Personally, I’d rather see movements of tolerance and acceptance for everyone, no matter race , religion, or sexual orientation first. Let’s include everyone and THEN talk about changing traditions concerning women. I still cannot believe that God looks down upon us and applauds our extreme exclusion of LGBT, that He commends “sticking to our guns.” It’s completely backwards for a God that I believe is unconditionally loving. I think it is a fallacy to assume that the way things are running now is how God would actually do things were He here. So as women, let’s embrace our divinity, and accept our own place in the Universe that “the gods ” created, and bless our children and our families, and call down guidance from the angels and be examples to our neighbors, and have tolerance, and accept those who are different, and seek our own understanding, teach THAT to our daughters and continue THAT tradition. Can we really say in one breath, “We sustain the prophet,” and then in the next, “We call for the ordination of women”? This seems like the key to your critique of Ordain Women. I think the answer is an unqualified “yes.” The answer would only be “no” if you buy into the idea (which I admit is common in the Church) that to sustain a leader means to never question them, bring new information to them, or ask anything of them, but rather to hold them as infallible communicator’s of God’s will. I believe in fallible, human leaders, so I say of course it’s possible to sustain the prophet and also ask him to do things that he might not have considered. Once you STOP even trying to sustain the leaders of the church because you no longer believe they are particularly entitled to inspiration–when, in fact, you think they are LESS likely to get any sort of inspiration at all because they are blinded by their privileged and cloistered life and a desire to protect a status quo they don’t even understand from change they don’t understand–you realize that most sincerely active Mormons really do manage surprisingly well to “sustain the prophet” even as they experience doubts and recognize the faults of the church–and even occasionally voice them to leaders. It’s quite shocking, actually, to pause a couple of years after you stop attending church and think back on how people told you when you were still active that you didn’t support the prophet enough and to realize just how much you importance you invested in what they said and how genuinely you tried to live by it. Ziff, thank you for your comment. I absolutely agree that one can sustain the prophet and still question the status quo. One can sustain the prophet and still bring questions before him. One can sustain the prophet and still ask him to consider alternate solutions/positions. But can one sustain the prophet and presume to tell him, in very specific terms, what to do? Can one sustain the prophet as the mouthpiece of God here on the earth, and still presume to know and declare what’s best for the entire Church? This is where things get tricky. This is where we start crossing into dangerous, prideful territory. It’s the “we call for” language that keeps tripping me up. But can one sustain the prophet and presume to tell him, in very specific terms, what to do? Can one sustain the prophet as the mouthpiece of God here on the earth, and still presume to know and declare what’s best for the entire Church? Actually, given that the church claims to be god’s kingdom on earth, it’s not just what’s best for the entire church but the entire world. Which is utterly preposterous…. except that we do it all the time. In 1977 when prominent leaders of the church were making public statements that black members of the church would *never* get the priesthood … what would have been the appropriate response of a member deeply troubled by this policy and sincerely wanted to see it change with all their heart? I would also add an additional question, I think is implicit, if not outright stated in your OP: which one would be most effective in a) bringing about the change in policy & b) helping those members advocating for the change & those affected (in this hypo black men, in our case women) assert their self-respect? Sorry @Catherine Worthington, sent that comment b4 I typed your entire name at the top. To answer your question, yes. I would consider changing the language on the OW website. But, only if someone provided me a compelling enough case that it would be more effective in getting women the priesthood and helping women like me assert my self-respect in the process, to do so (a.k.a. reaching what I consider to be our long & short-term goals). Okay, to your question. First of all, the two situations are not analogous. Again, if being ordained to the priesthood were an inherent “right,” then comparing the Ordain Women movement to the Blacks and the priesthood issue would make more sense. But ordination is *not* an inherent right. I firmly believe that God’s power (the priesthood) is available to all God’s children. At the same time, I believe that God can certainly choose to *ordain* whoever He-She wants to carry out specific functions of that priesthood (in this case, the administration of the sealing ordinances). Perhaps there are very good reasons that we do not yet fully understand why men/fathers are ordained to perform these sealing ordinances. I’m not saying that that’s the way it is, but I’m open to that possibility. The truth is, there’s so much we don’t know. As a result, I think it’s imperative that we acknowledge our own very limited view and seek continually and humbly to know and understand God’s will (rather than presuming to already have the answers). We must take great care that we do not “darken counsel by words without knowledge” (Job 38:1). That said, because I hold that the Church is not a secular organization, but is, rather, the Body of Christ, led by Him, and directed here on the earth by a prophet who is His mouthpiece and who holds the keys to revelation/inspiration/enlightenment (that is for you, Martin :-)) for the Church as a whole, then I must say that the answer to your question must be that, yes, we ask those leader–flawed and imperfect men who are nevertheless called of God and imbued with the power to be prophets, seers, and revelators–to pray for enlightenment for the entire Church. We do whatever we can to bring our concerns to their attention and we plead with them to seek further light and knowledge on these issues. We ask our questions, we pray, we gather information, we mobilize, we give voice to our confusion, our pain, and we present our ideas and suggestions in the most effective ways possible. We use our free will however we can to bring about much righteousness. But it is at our own peril that we set ourselves up as a light on a hill and presume to speak for God. I think you have fleshed out your position very well by the end of these comments, and I agree with you on the whole on the “call for” language. I would note that asking them to do anything at all is calling for them to do something (in other words, if you want them to pray about it, you are essentially “calling for them to pray about/consider/ask about/reflect upon X). This doesn’t seem to be inappropriate in this case. Why? I think it is because it is because (a) it does not demand for a specific course of action for policy change, and (b) it keeps the discussion in a spiritual realm and appeals to God–often at least–which reinforces a spiritual motivation for the topic. It is essentially open-ended versus close-ended, demanding attention, but not specifying the results. I think one can do more than call for prayer, but to call for answers. One can state, “This looks to me like a clear case of sexism for such-and-such reasons. Can you pray about this, and if I am wrong, can you explain to me how I am in error?” Why any leader would not want to grant such answers I cannot understand. Of course, now that I think about it, I don’t know if there is anything wrong with offering suggestions if something needs to change either. But then again, if you are doing that, you are not demanding that a specific suggestion must happen. I think suggestions, especially when in the plural, are a good idea. You are so good to respond to so many of these comments. Your post really spoke to me and I agree whole heartily. I love your openness and honesty. I follow LDS feminist blogs because I consider myself a feminist. Unfortunately I find the tone of many feminist post to be off. I have not been sure why. I feel like over the course of responding to everyone’s comments you have helped me more clearly see what I feel is off in other post. when you write I feel a sense of your humble desire to trust God, and his prophet. So many other post give me a feeling of disdain, and pride . It immediately turns me and so many other LDS sisters away from this movement. I don’t feel that way at all when I read your post, yet ultimately your goals are not different from Ordain Women. Other feminist in this movement need to take note to your point about wording and tone. Helping change the tone from within would really help grow the movement. Good luck in your efforts. So, here are my final words on this subject (whew! say many of you. 🙂 ). I have loved this conversation, and I sincerely appreciate all of your comments and insights. I hope we all realize that we are on the same team. There is much that needs to be done in the Church to ensure that women’s voices are heard and valued. I hope that as women we can lay claim with equal measures of confidence and humility upon the infinite power that we have but may not yet fully recognize. It appears to me after your answer that perhaps the only thing we disagree on is simply the word “call,” so we are absolutely, most definitely on the same team! When you wrote “here are my final words on this subject” I do hope you meant you were excusing yourself from the interminable argument of “calling for prayerful reconsideration” versus “calling for ordination” but not necessarily ceasing all conversation regarding your original post. I am hoping you will still read and respond to new comments because I feel you have been cheated out of a fruitful conversation by many of the commenters as not a single person actually addressed what you clearly stated was the main issue – the fact that LDS women do not know our Heavenly Mother. I was just wondering if you wanted to read an essay that actually addresses this issue, and provides for the first time a specific, scripture-based reason as to WHY God the Mother has never been revealed. I believe as you do that it is only by and through the answer to this question that we can ultimately come to a complete understanding of Heavenly Mother and Her priesthood, but I am reluctant to write any further regarding this issue in case you are not interested in researching it. P.S. I loved your post and wish that all LDS feminists were as spiritual, truth-seeking and open-minded as you are. I look forward to your future posts! I loved and agreed wholeheartedly with your article until I got to the comments about our Heavenly Mother. It seems to me you are doing the same thing you don’t feel the “ordain women” group should do. We have a living prophet. He will convey the mind and will of the Lord to us. It is not our place to council our Savior or his prophet. Elder Hales said it best, “we wait upon the Lord”. It is His kingdom, His church, His plan. I cannot agree with anyone who thinks they know better than He what is right for us, but I love you as my fellow sister.